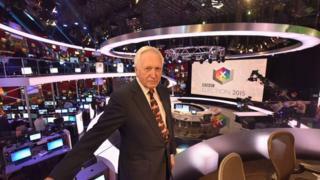 David Dimbleby is to host the BBC's 2017 general election programme. News presenter Huw Edwards had been expected to front the show after Dimbleby said 2015's results coverage was his final time at the helm. It will be the tenth occasion that Dimbleby has hosted proceedings, having first fronted the broadcast in 1979 when Margaret Thatcher became prime minister. The programme will start on the night of 8 June and continue until morning. Edwards will take over as lead presenter on the morning of 9 June and will also present the evening bulletin that day. BBC director of news James Harding had said ahead of the 2015 general election that it would be Dimbleby's last time as lead anchor, with Edwards set to front the show from then on. He said: "This snap election surprised the country and election night is bound to be one of the most closely followed in recent times. "BBC's results night will once again offer people the most reliable breaking news, impartial analysis, with a host of trusted experts and above all our unrivalled presenting team." Dimbleby, 78, who also hosts debate show Question Time, will be joined in the studio by Mishal Husain, Emily Maitlis and Jeremy Vine. BBC experts including political editor Laura Kuenssberg and economics editor Kamal Ahmed will be giving their views on the proceedings as results come in. The programme will be broadcast simultaneously on BBC One, the BBC News Channel and BBC World News.